Let's face it Friends: with stock market fluctuations, civil unrest and presidential primaries in the making, all of us could use some feel-good music in our lives. 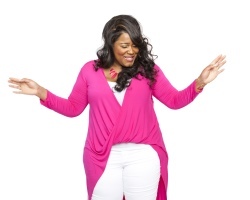 That's exactly where emerging gospel artist Michelle Brooks-Thompson comes in, singing His praises and galvinizing for His glory in the light-hearted and optimistic midtempo, "When I Think." A lot of today's gospel has grown brash and bombastic, undergirded with hip-hop flourishes and becoming all-but-indistinguishable from contemporary R&B, but Thompson's divine ditty remains uplifting and accessible without 'doing too much.' Its message? Not to rue and lament what we feel we should have but to shout for what He's already given us and the mercies we've been bestowed via His infinite love and grace. A lot of today's gospel has grown brash and bombastic, undergirded with hip-hop flourishes and becoming all-but-indistinguishable from contemporary R&B, but Thompson's divine ditty remains uplifting and accessible without 'doing too much.' Its message? Not to rue and lament what we feel we should have but to shout for what He's already given us and the mercies we've been bestowed via His infinite love and grace. Her vocals are sweet, the melody soothing and the sentiment is universal enough to hit listeners where they live no matter whom they happen to call 'Father.' A timeless message just as many of us need to hear one, no sour notes about that. Michelle Brooks-Thompson - "When I Think"